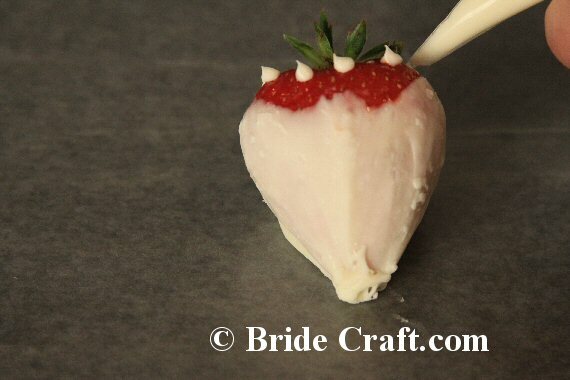 Simple Gourmet Strawberries for your Wedding Favors! 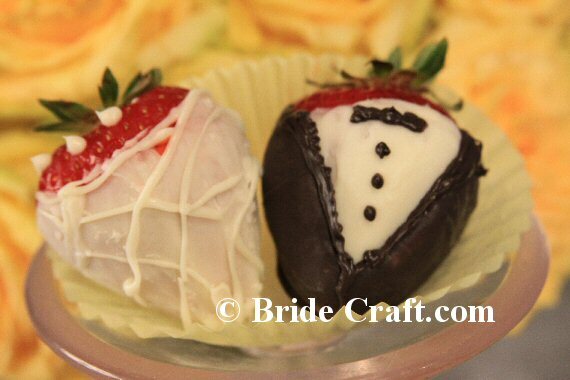 Thinking of gourmet strawberries for your wedding favors? Dismayed by the gourmet price tag? Try your hand at this well loved favor! Delight yours guests with both a sweet treat and your amazing chocolate dipping skills. Pros: You can save a ton of money on this favor if you had your heart set on it by creating it yourself. This is a fairly simple project that you can master with some minor practice. And it’s easy for bridal party and helpers to create assembly line style. No complicated supplies needed! Cons: Can be time consuming and needs to be created close to the wedding! Try a sample out to gauge how much time and supplies you will require. Logistics are important with this project. Not recommended for a very large wedding. 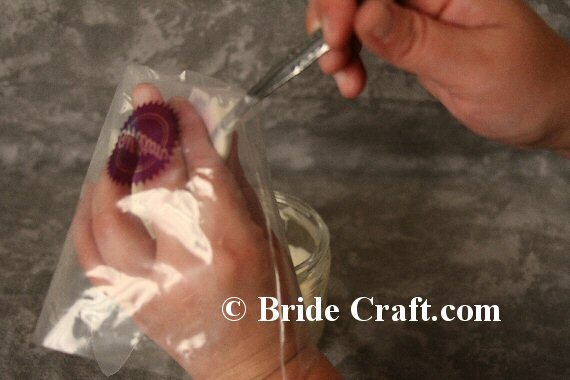 Step 1: You will need two microwave safe bowls or containers, white and black melting chocolate, wax paper, sheets or trays, scissors, spoons, several piping bags and fresh strawberries. 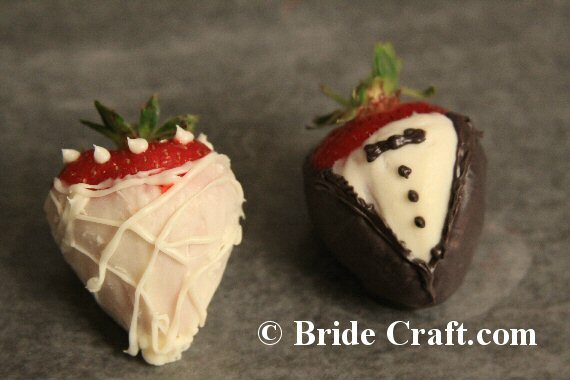 Step 2: Start with the bride gourmet strawberry favor. 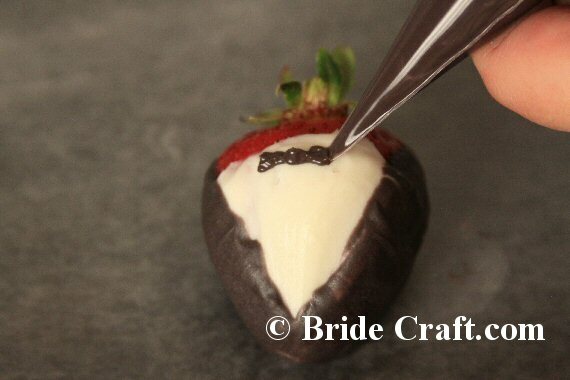 Follow the instructions on the chocolate package and begin coating the strawberry like so. Make sure to get front and back coated as you like. 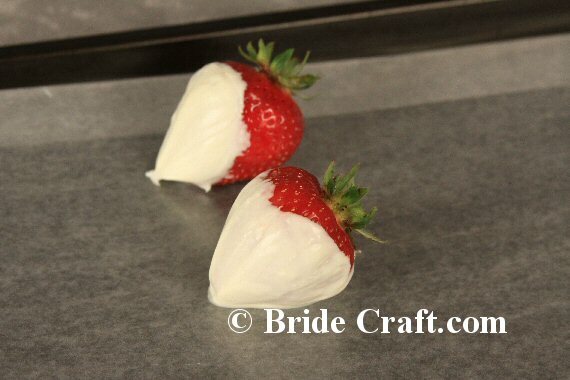 Step 3: After you’ve coated each strawberry, lay them out to set on a tray with wax paper. Step 4: Begin prepping an icing bag with more melted chocolate. Trim a very small hole at the tip of the icing bag. Then hold the bag from the tip and fold the edge back over your hand. Take a spoon and scoop the chocolate into the bag, using your plastic covered fingers to help ease the stick chocolate off of the spoon and into the bag. Step 5: When the bag is as full as you would like, tie off the open end by twisting it. TIP: Prep a bag of black chocolate the same way as you will need this shortly as well. Step 6: Proceed to put delicate, equally spaced (or as close as possible) dots of chocolate along the top of the strawberry. These represent the o-so-bridal string of pearls. 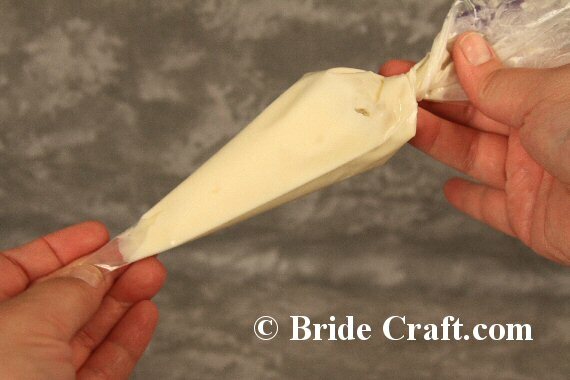 TIP: Leave the strawberries on the wax paper tray for this and the next step. Step 7: Next, you can pipe loose little squiggles all across the body of the strawberry, and even clean up the “neckline” of the little chocolate coated dress. 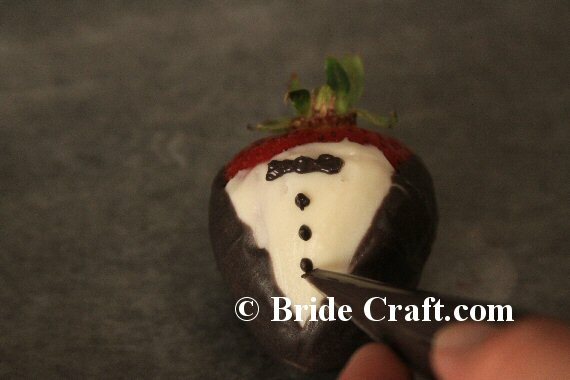 Step 8: Move onto a Groom strawberry. 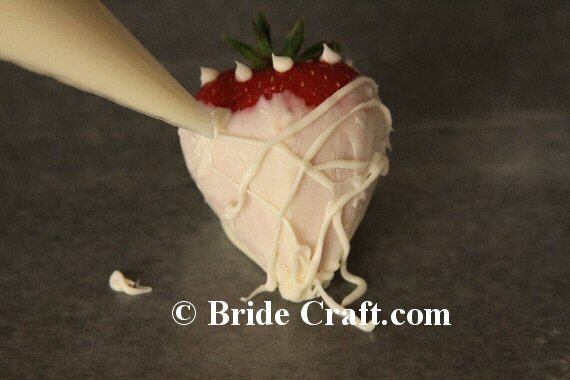 Carefully start dipping the front of a strawberry into the white chocolate. Continue by melting down the black chocolate as instructed. 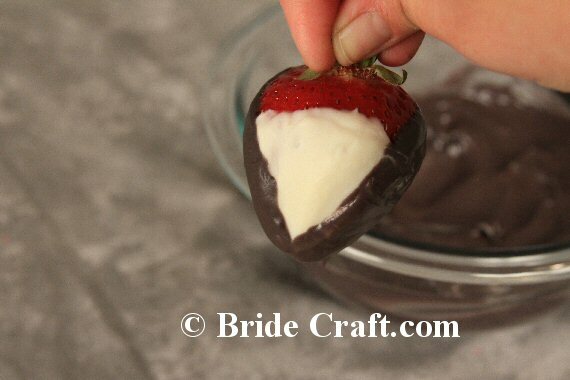 As soon as the white chocolate sets enough, dip the strawberry into the black chocolate on either side, creating a V of white in the center, as shown. 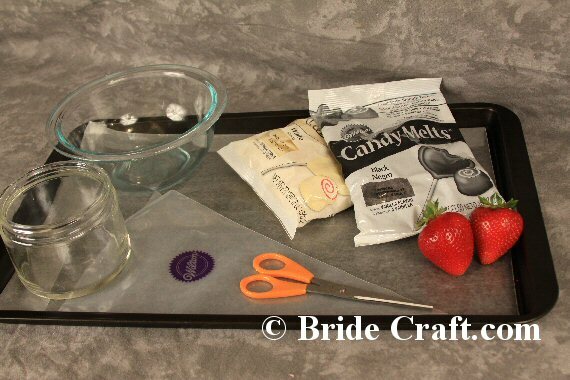 Lay a sheet of waxed paper on a new tray and let the strawberry set. Step 9: Pipe a simple bow tie or straight tie as desired. Step 10: If appropriate, pipe buttons down the front of the shirt. Tip: Bow tie and buttons or tie. Typically you wouldn’t notice the buttons on a shirt as much if the gentleman is wearing a tie. What IS the groom wearing? This is a cute opportunity to customize a favor. 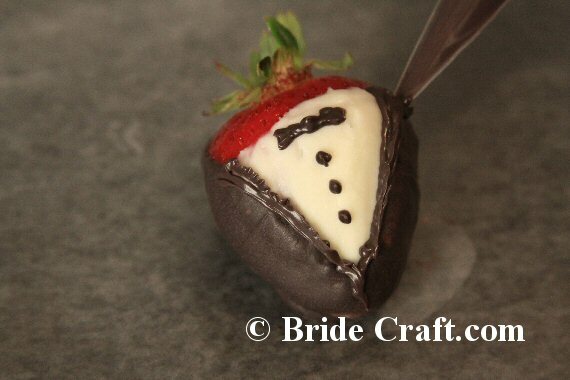 Step 11: Clean up the groom strawberry by piping a crisp lapel on either side of the white chocolate. Step 12: Chill, display and serve your amazing gourmet strawberries! 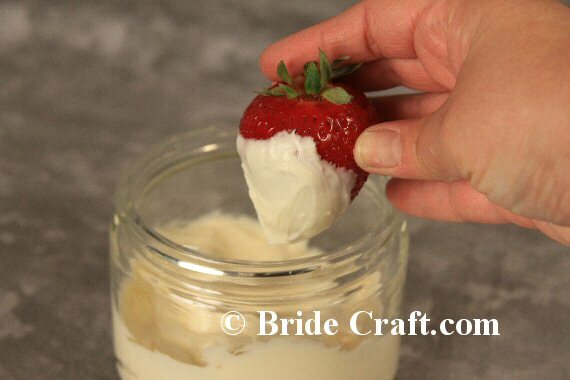 Return Gourmet Strawberries to DIY Wedding Favors.